With the collapse of the Berlin Wall in November of 1989 and the official reunification of East and West Germany in January of 1990, the reestablishment of East German business was paramount. For Walter Lange, the great grandson of Ferdinand Adolf Lange, the demise of the wall was a great opportunity to revive the German watch company originally formed by his grandfather — which had been expropriated during the communist regime. Indeed, 100 years of remarkable watchmaking ended abruptly when A. Lange & Söhne’s workshops fell victim to seizure during World War II. The hiatus of the brand that that had roots dating back to 1846 — would last more than forty years until the reunification of Germany and fourth-generation Walter Lange’s return to Glashütte. From 1846 onward, Ferdinand Adolph Lange made many watchmaking developments. When his son Richard joined the company in 1868, the brand was officially named A. Lange & Sohne (son), and remained a family run company. In the 1920’s, with the global economic disaster, all of Glahsutte’s factories merged into two groups to cope, and under this structure, the brand continued to produce timepieces. However, in 1945, Russian bombs destroyed the workshops and in 1948, the company was confiscated by the communist government and nationalized. Third-generation Walter Lange fled East Germany. Finally, with the collapse of the communist regime in 1989, the now 90-year-old Lange returned to Germany with hope and forethought. The back of the A. Lange & Sohne Perpetual Calendar Terra Luna offers an orbital moonphase display accurate to within a day for more than 1,000 years. In 1990 Walter A. Lange, along with Gunter Blümlein, renowned visionary in the watch world and head of IWC at the time, began setting out plans to rebuild the Lange factory and brand in the town of Glashutte. In 1990, Lange Uhren GMBH was registered in Dresden and the traditional trademark of A. Lange & Sohne was adapted. It was then that the real work began. Walter Lange wanted the first Lange watches to reflect the past, but also to have a visionary and modern appeal. It took years before the first timepieces were released. 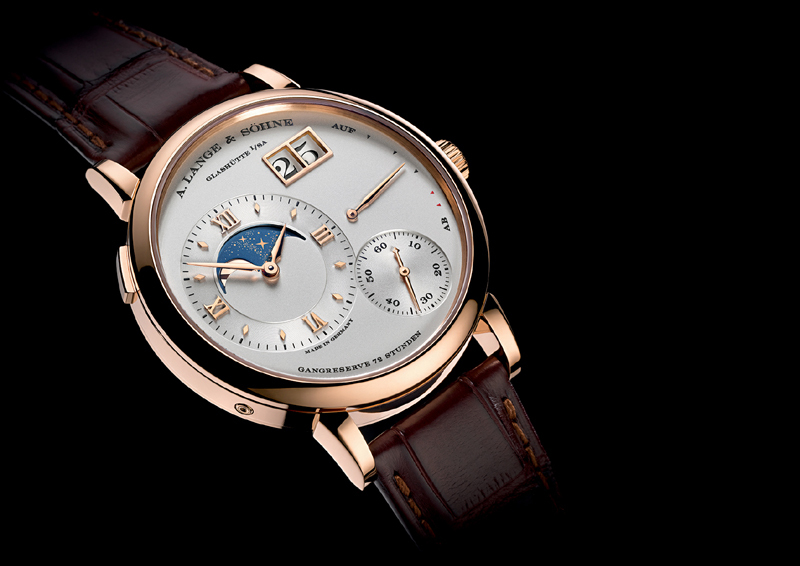 The now -signature outsized date was the first patent awarded to A Lange in 1992 and would be the first of many. By 1994 Lange had four prototypes ready to show the public, the Lange 1, the Arkade, Saxonia, and the Lange Tourbillon. 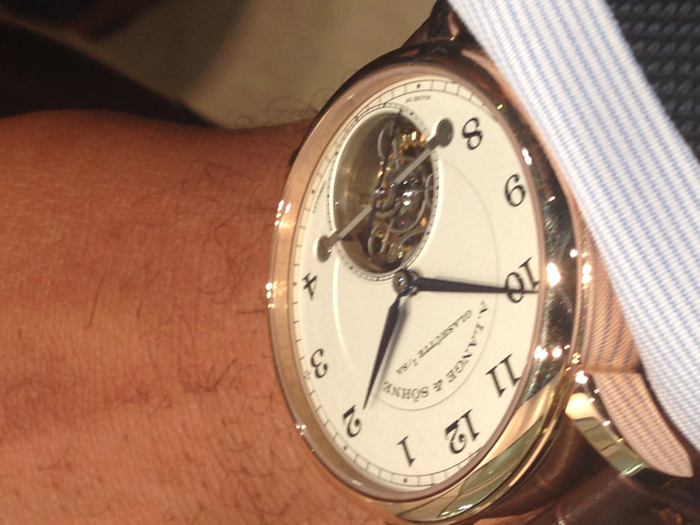 All of the prototypes, save the Tourbillon, featured the large date window. With its unique styling, level of detail and story the brand quickly took the watch world by storm and overnight became a favorite. By 2011 and only ten years later, Lange had compiled 40 calibers and won more than 150 awards. Today the German brand, with state-of-the-art Manufacture in Glashutte, easily stands as one of the premier brands in the world of horology and continues to raise the bar on luxury timepieces. Among the most coveted watches from A. Lange & Sohne are the 1815 Tourbillon and the famed Zeitwerk. 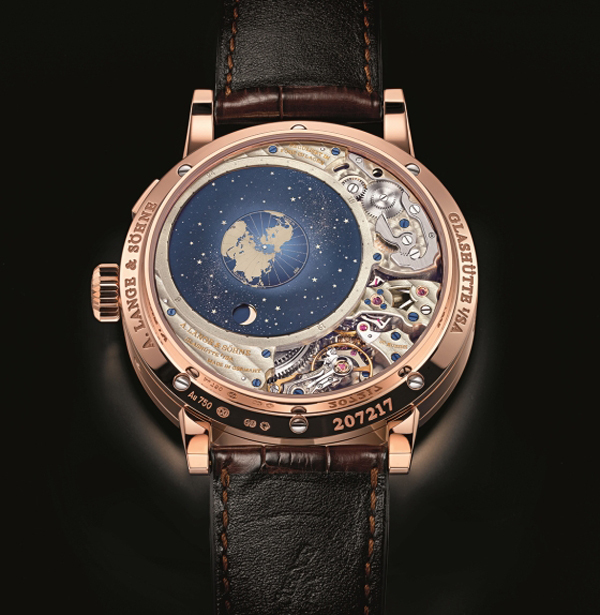 This year alone, the brand released multiple watches that are among the most sought-after by watch collectors: The Richard Lange Perpetual Calendar Terraluna and Grand Lange 1 Moonphase.